Hello out there! It's been a while since i blogged - we have been very busy doing lots of stuff. Today was a good day! I showed pigs at Seguin Swine Breeders Show today - i placed third in Showmanship - Dad said i did a great job!! i also placed 3rd and 6th with my durocs - Kase did good too - he placed 2nd with his hampshire. Konni also did very well - she always does! After the show, Mom took me to Walmart and i got my own Christmas tree for my room - i got new ornaments and decorated it today! It is the best tree ever! Hope everybody has a great Christmas - love you all! bye for now! Last Day of Being 7 Years Old!! Today is July 2nd. Tomorrow is my 8th Birthday!!! Here is a picture of me today - the last day of being 7 years old. 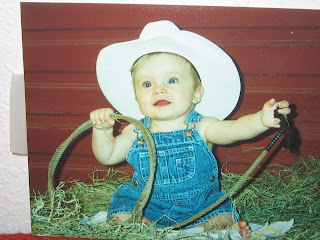 The other picture is of me when I was a baby. Wasn't I cute? My cousin Cheney and my friend Alexander are spending the night tonight - we are going to the movies and out to eat at Chili's - I can't wait!!! I am going to Vacation Bible School this week with my cousin Cheney - it is so much fun- it is called Boomerang Express and we get to do all kinds of cool things - arts and crafts, play games, learn songs and other stuff - we are having a program one night so we can show our family what we have learned - i wish it would last longer! Today is a boring Saturday- we had to go to Kase's little friend's birthday party - it was at J&R Gymnastics and that was fun -but now i am just watching tv, blogging, and playing on the computer - i want to do something fun later - i am going to Vacation Bible School with my cousin Cheney next week - it is called Boomerang Express - and i can't wait - i will tell you more about that next week - stay tuned! This is my group for the Seguin Outdoor Learning Center Camp that i just went to this week - it was so much fun - i got to catch fish, go canoeing, do arts and crafts, play games and ride on a tractor - the funniest part was my group's name - we were the Viper Dogs that Live in the Ridiculous Water Lands that Like Sponge Bob and Ninja Turtles!!! Can you remember that? We did - it was great fun!!! 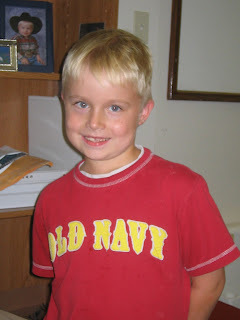 Here is a picture of me - I am almost 8 years old and just finished 1st grade. I like to play my Nintendo DS, watch Animal Planet and Discovery Channel, and play outside. I also like to hang out with my family and do stuff, like work with our pigs. I will show you pictures of that soon. Hello My name is Karson and this is my first blog. I am excited to be blogging and will post some exciting stuff. Be sure and check it regularly. I hope you like adventure, because there is gonna be alot of it!! Thanks for checking it out! !